March 28, 2019, 12:11 p.m.
When’s the last time you really archived a story? Maybe…never, considering Google Docs and GitHub, both privately owned, don’t really count. In what should hopefully be a reality check for many, Columbia University researchers Sharon Ringel and Angela Woodall analyzed the archiving mindsets and habits of the journalism industry through interviews with 48 individuals across 30 total organizations starting in March 2018. For a field that likes to consider itself the author of the first draft of history, the vast majority of those authors don’t prioritize how to save and share that history in the future. “Preserving digital content is not, first and foremost, a technical challenge. Rather, it’s a test of human decision-making and a matter of priority. The first step in tackling an archival process is the intention to save content,” Ringel and Woodall wrote in their report published in Columbia Journalism Review today. a core team that works on the Times’s archiving efforts, which are part of a broader internal effort called Project Kondo (as in, life-organizing phenomenon Marie Kondo) to review old features and initiatives on the site — and then decide what to save and what to shut down. Let journalism archives spark future joy. Schmidt, Christine. "“Of the 21 news organizations in our study, 19 were not taking any protective steps at all to archive their web output”." Nieman Journalism Lab. Nieman Foundation for Journalism at Harvard, 28 Mar. 2019. Web. 24 Apr. 2019. Schmidt, Christine. "“Of the 21 news organizations in our study, 19 were not taking any protective steps at all to archive their web output”." Nieman Journalism Lab. Last modified March 28, 2019. 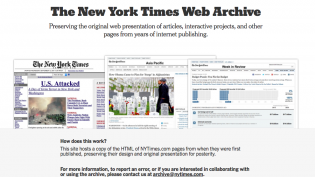 Accessed April 24, 2019. https://www.niemanlab.org/2019/03/of-the-21-news-organizations-in-our-study-19-were-not-taking-any-protective-steps-at-all-to-archive-their-web-output/.